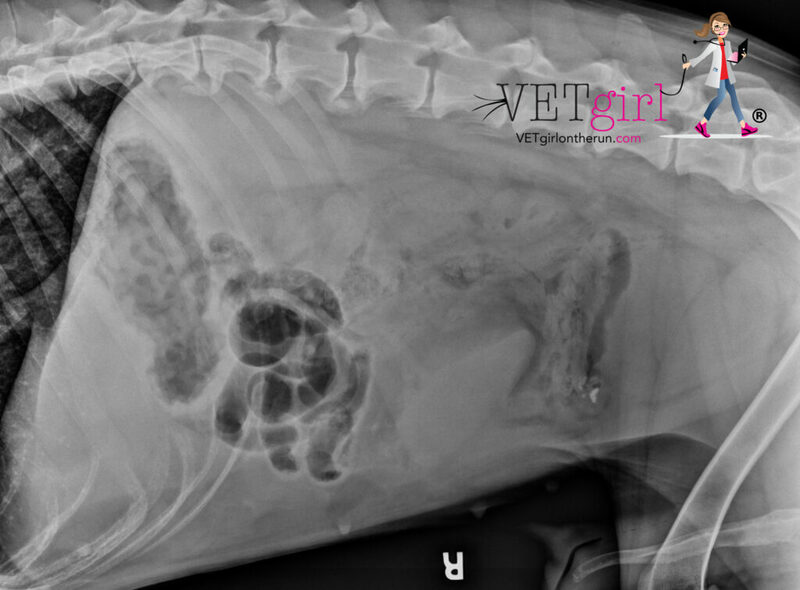 In this VETgirl online continuing education blog, Dr. Garret Pachtinger reviews how to diagnose uroabdomen in a dog or cat. Uroabdomen is a life threatening condition that results from urine leaking into the abdominal cavity. Trauma is the most common cause for uroabdomen, but other causes including neoplasia, urethral obstruction and iatrogenic (e.g., cystocentesis, unblocking, catheterization) may also result in the leakage of urine into the sterile abdominal cavity. When urine is present within the abdomen, life threatening illness results from serious electrolyte disturbances (e.g., hyperkalemia), accumulation of waste products normally cleared by the kidneys (e.g., creatinine), and irritation, inflammation, and potentially infection of the lining of the abdomen (e.g., peritonitis, potentially septic). 1) An appropriate history, triage examination, and complete physical examination are imperative (just like with any patient!). 2) Bloodwork: As can be seen here, mild (to severe) azotemia may be present. 3) Abdominal x-rays may show decreased abdominal detail. An outline of the bladder may or may not be present. 4) AFAST ultrasound (VETgirl review of Abdominal Focused Assessment using Sonography for Trauma HERE) often shows abdominal effusion and potentially even a leak around the bladder (as seen in the video below). 5) While a uroabdomen is difficult to diagnose cytologically, the clinician should measure the creatinine and potassium levels in the abdominal effusion and compare the values to peripheral blood values. A fluid to serum potassium ratio > 1.4 to 1 has 100% sensitivity and specificity for uroabdomen. A fluid to serum creatinine ratio > 2 to 1 has a 100% specificity and 86% sensitivity. As BUN is a smaller, easily diffusible molecule (across the perionteal membrane), we typically don't compare ratios of BUN in the effusion as compared to the peripheral blood. As compared to the peripheral blood sample values above, the values below are the patients effusion values! Here is a photo of the patient's ruptured bladder in surgery! 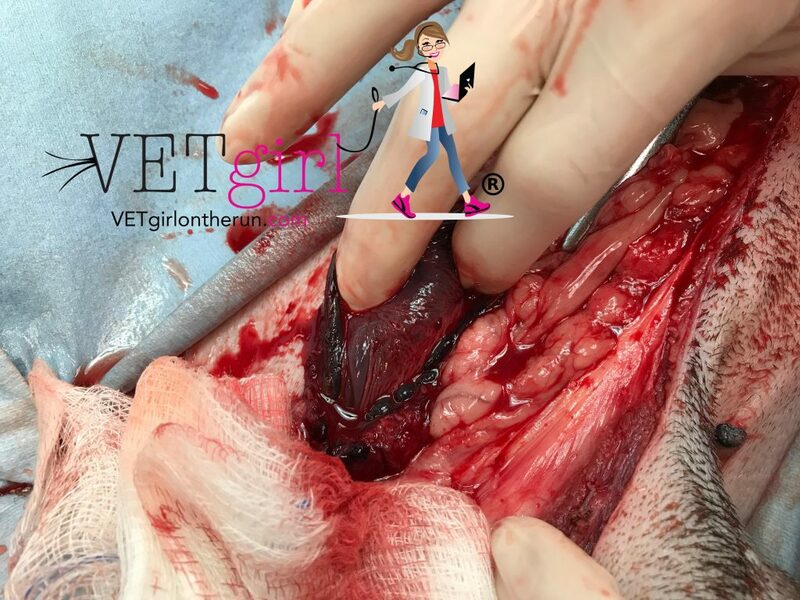 When in doubt, rapid recognition and identification of uroabdomen in the veterinary patient is imperative (along with initial stabilization and analgesic therapy), as surgical treatment is often warranted. Schmeidt C, Tobias K, Otto C. Evaluation of abdominal fluid: peripheral blood creatinine and potassium ratios for diagnosis of uroperitoneum in dogs. J Vet Emerg Crit Care. 2001;11(4):275–280. If there is client has financial limitation could the patient survive without surgery?